Larix laricina.immature cones.Arthur Haines.New England Wild Flower Society.gobotany.newenglandwild.org. (Accessed 9/2014). 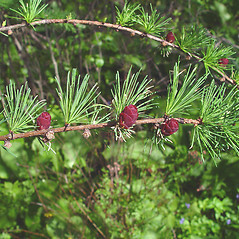 Larix laricina is a conifer tree to 20 m tall. Leaves: needle-like, deciduous, soft, to 2.5 cm long, in clusters on short shoots or scattered along new growth. Fruit: none. Cones to 2 cm long, with 10-18 scales. Frequency in New York City: Very infrequent, mostly planted. Habitat: Usually in acid bogs, soil pH 5.5-6.5 (USDA, NRCS 2010). Notes: Leaves buds and seeds eaten by a few birds (Martin et al. 1951).